Image: Reconstruction of Homo habilis, of a Hominini tribe. Westfälisches Museum für Archäologie, Herne. Wikimedia Commons. ‘Beastly,’ was the first word of a child George Orwell; he was eighteen months old and bedridden with bronchitis. Russel Brand’s first words were ‘don’t do that’—appropriately repressive? Steven Spielberg asks back with his first, ‘why?’ Bambi the deer first spoke, ‘bird’. And at some point between 2.5 and 1.8 million years ago, under the hot sun of African savannah, our prehistoric primate ancestors spoke their first words. A recent study suggests that these first ever verbal conversations, the first words of humankind, were in reference to tools. Published in the journal Nature Communications, the study presents evidence that it was the use of stone tools that helped drive the evolution of language. In turn, this helped drive the evolution of tools. In fact, a possible first sentence may well have been something like, ‘mate, this hammer is fantastic’. (Though probably not in English). Our ancestors, tribes of primates referred to as Hominini, used ‘Oldowan’ tools: a basic stone tool system of ‘choppers,’ ‘scrapers’ and ‘pounders’, thought to be the earliest stone tools in prehistory. The knowledge of how to create and use these tools was passed between the hominins socially and inter-generationally; their survival was dependent on it. It is thought that this strong reliance on the transmission of knowledge created an evolutionary need for verbal communication. And voilà, language. “The use of sounds or gestures for non-emotional concepts such as ‘yes,’ ‘no,’ ‘here,’ ‘there,’ ‘good’ and ‘bad’ would likely have been really useful,” says lead author of the study, Thomas Morgan, a postdoctoral researcher in psychology at the University of California at Berkeley. Dandy valid reasoning. However some argue that a process of chimpanzee-like imitation alone would have been sufficient in conveying the knowledge of Oldowan tool use. That is, without any need for speech, the hominini upheld their culture of tool-making through silent mimicry alone. 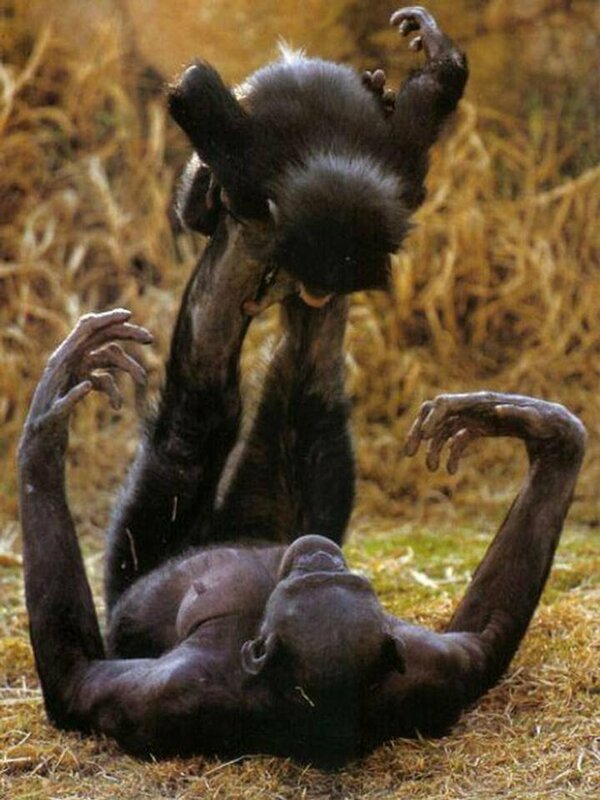 A reasonable point considering bonobos have been trained as adept users of Oldowan tools. But here the plot thickens: from 2.5mya (million years ago) onwards there appears to have been a ~700,000 year stasis in the use of Oldowan tools. It was not until about 1.8mya when ‘Acheulean’ tools mysteriously began to emerge. 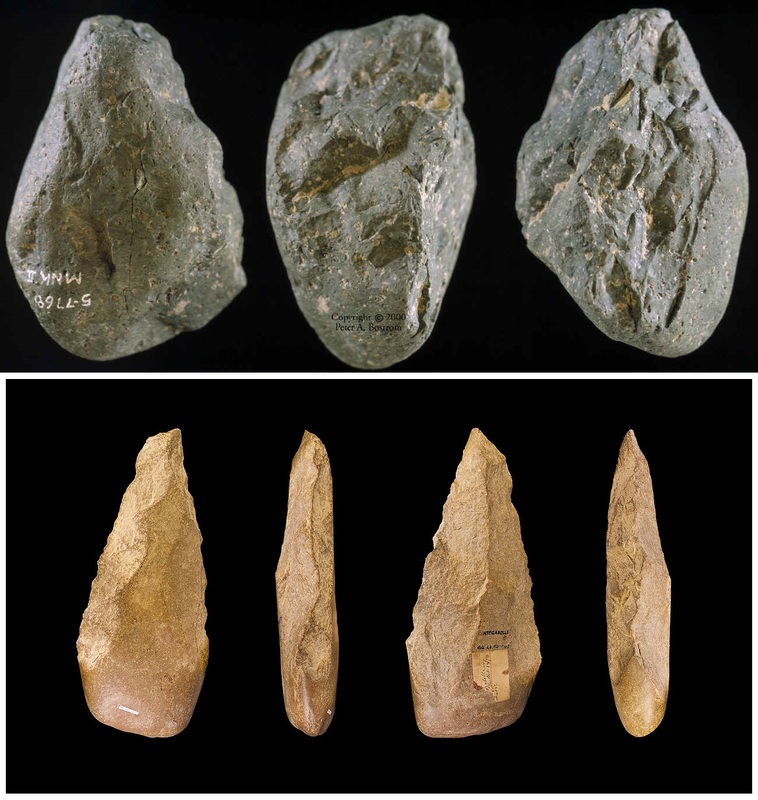 Acheulean tools, distinctively pear-shaped, are considered by archieologists as ‘Mode 2’, the first step up from the more primitive Oldowan tools. So why after all that time did our ancestors suddenly progress? Morgan’s answer to this is the through the advent of speech. Upper image: Photograph of Oldowan ‘chopper’. University of California–Berkeley, Dept. of Anthropology Collection. Credit: Peter A. Bostrom. Lower: An Acheulean handaxe. Credit: Didier Descouens. Wikimedia Commons. To support this thinking, Morgan and his colleagues did what all social researchers do: they hustled up an agreeable rack of 184 undergraduates. They also shipped in two tonnes of flint from Norfolk, England and 100 granite ‘hammerstones’ collected from the beaches Scotland. With all this, they simulated the learning and teaching of ‘stone-knapping’, an Oldowan technique of using a hammerstones to craft small sharp flakes of flint. Five different forms of communication were tested: some students had to rely on imitation alone; some were taught by a silent teacher, with varying degrees of interactivity; in one group students could use gestures, such as pointing; one group was granted the use of speech; for the last group, individuals had only completed flakes of flint to guide them. Once a student had attempted to learn this skill it was then their turn to teach a new pupil, communicating through the same means—and so on, continuing in a chain of learning and teaching. To motivate the undergrads, just as the hominins were motivated by survival, students were offered a cash incentive. If your flakes were high quality, if you made loads of them, if you were a good teacher, then at the end of the day you would be given more money. Testing the different modes of transmission, the researchers found that demonstration using spoken communication, versus imitation, non-verbal presentation or gestures, yielded the highest volume and quality of flakes in the shortest amount of time and with the least waste. The similarly low performance of students relying on imitation and students who received no help at all indicates that the stone-knapping technique could not have become as mastered by the hominins as it was, nor as widespread, without the use of “higher-fidelity” social transmission. On the results of this experiment, Morgan reasons that observational learning alone lacks the exactitude required to transmit more complex innovations, thus constraining a cumulative process of cultural evolution. To evolve beyond the Oldowan, to emancipate ourselves from the 700,000 year hiatus, our ancestors needed a higher-fidelity system of communication. They needed speech. We look from one to the other in our speechless grassland, under black and purple of waning sun. A moth moves bent and sideways along the slope of the valley. We sit by before the hill becomes steep. Before us the hill lurches upwards, looms and bloats out dusk sky like a mad wave. Atop the hill steps forward Hominin. She stands high and breathes evening Africa; The messiah and naked bar her cape of firmament. We look at her, from our hands then to grass, silent. Dusk becomes bent and wilted against the hill and the Hominin. We look up at her and the Hominin speaks. She speaks and we refuse, one by one sporadic we stand abrupt and cautious and we shriek at her with our lips curled, and we recoil to her, back to the shadowed grass and up again, each taking his turn in our new angry insanity with our shrill wordless yells in the night. The Hominin speaks again. She is your gatekeeper. Her words are your tumultuous pinnacle and silent ultimatum. She is the small and giant leap of your iron against wood, your ringing bells, mad cackling and the nuclear war. She is your whirring, laughing cacophony of woman, man and machine. 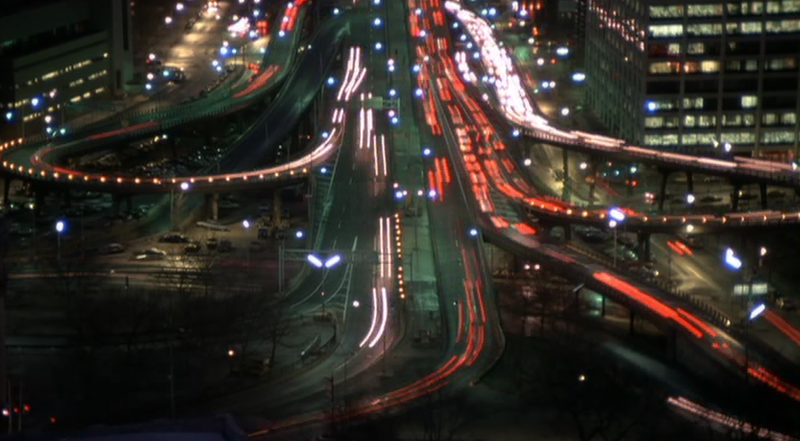 Image: Still from Godfrey Reggio’s 1982 film Koyaanisqatsi. Editor’s note: Lapsus has been experiencing technical difficulties. If you notice anything a trifle silly, such as articles not really ending properly and becoming very weird very quickly, perhaps even unpleasantly existential, please bear with us—we’re working on fixing this. From all of us at Lapsus, we apologise and sincerely hope it doesn’t detract from your otherwise beautiful Lapsus experience. Enjoyed this article? You might also be interested in tickling schizophrenics. Or perhaps you’d like learning psychopathology with Seinfeld. Clark, J., de Heinzelin, J., Schick, K., Hart, W., White, T., WoldeGabriel, G., Walter, R., Suwa, G., Asfaw, B., Vrba, E.; et al. et al. (1994). African Homo erectus: Old radiometric ages and young Oldowan assemblages in the middle Awash Valley, Ethiopia. Science, 264(5167), 1907–1909. doi:10.1126/science.8009220. Viegas, J. (2015). First Conversations 2 Mln Yrs Ago Likely About Tools. [online] Disocvery News. 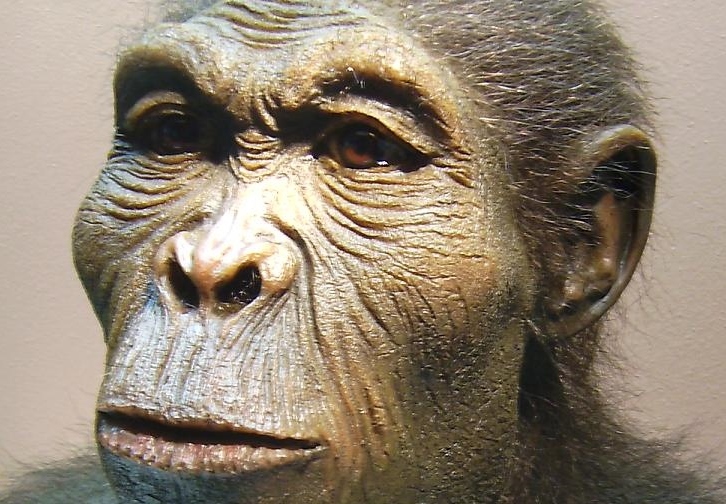 Available at: http://news.discovery.com/human/evolution/first-conversations-two-million-years-ago-likely-about-tools-150113.htm [Accessed 20 Jan. 2015].